o Suitable for Bench-Press, Incline Bench-Press, ‘Flys’, Rowing, Shoulder Press, Lat Pulls, etc. DELIVERED AS A ‘FLAT PACK’. Requiring some final assembly. Full instructions are included. 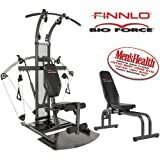 This entry was posted in Fitness Products and tagged Brand, Finnlo, Force, German, Multi, plus, Ultimate, Warranty, years by Summer 365. Bookmark the permalink.